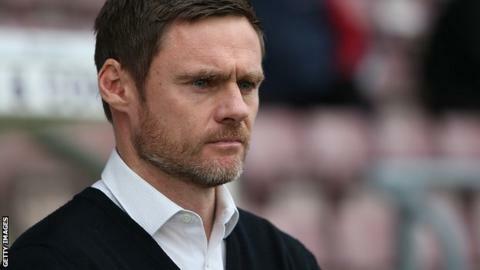 Manager Graham Alexander has stressed that Fleetwood are still in control of their own fate, despite his team missing out on automatic promotion. The Cod Army drew 1-1 with Southend on Saturday, allowing Scunthorpe, Rochdale and Chesterfield to confirm their spots in the third tier next season. Alexander's side will now attempt to go up via the play-offs next month. "Our destiny is still in our own hands. If we win the games, we get promoted," Alexander told BBC Radio Lancashire. Graham Alexander was in the Burnley team that won the Championship play-offs in May 2009. "I don't go along with the thought that it's a lottery. I think you earn it." Fleetwood have been in contention for a top-three finish for much of the campaign and could have been involved in a promotion decider with Chesterfield in their final game, but the Spireites won 2-0 at Burton on Sunday to clinch their place in League One next term. Fleetwood are guaranteed to finish fourth, although their play-off semi-final opponents have yet to be decided. The 42-year-old is now concentrating on ending the club's second season in the Football League with a Wembley victory. "We set the bar high here," added former Scotland international Alexander. "We have, as a club, taken really good strides this year. "We're all ambitious, we all want to be successful and we want to win promotion. We have to stay positive."